Now changing the sound is what audio effects are all about, and every time that I think there isn't any room for anything even remotely new, then up pops something that you hadn't considered before. So after a run of filter-based audio effects, I now had a nagging suspicion that there must be something that hadn't been explored with limiting (or its cousins, compression and expansion, and the evil twin, noise gating). Which is when a crazy idea popped into my head, and resulted in a series of limiter-based effects that reaches its natural conclusion in SyncLimiter. It is often said that there is nothing new. So I'm cautious about suggesting that this might be new, so I will caveat this with 'new to me'. I've never seen anything that deliberately mis-uses limiting with LFOs setting the threshold, but then I'm a very conventional user of limiters (as in keeping something with lots of time-varying gain stable, as in a swept comb filter) and so I may well merely be revealing my blinkered knowledge. 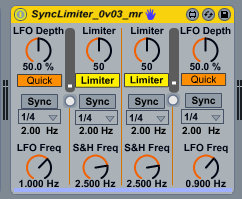 So with all that out of the way, I present SyncLimiter, an audio effect that has two independent limiters whose thresholds and compression ratios can be modulated by sample-and-hold captured sine waveforms from two independent synch-able LFOs. I've chosen the 'mirror' look for the UI, so the left and right hand sets of controls are reflected in the vertical axis. The first control to reach is the 'Limiter' control, which is just a lift from previous projects, and which does a complex mapping of threshold and ratio to give a single control that 'feels' right to me. At zero, there's only a slight effect, whilst at 100 there is maybe just a bit too much effect on the sound, and so the place to start is at a setting of about 50. (This is the default). After that, the 'LFO Depth' controls how much the LFO affects the Limiting, and the overall modulation is shown in the dark grey indicator. The 'S&H Freq' control alters the rate at which the LFO sine waveform is sampled (and held), and so at high frequencies (10 Hz) it has little effect, whilst at lower frequencies it chops the sine wave into a 'stepped' waveform. There's lots of scope for exploration here, with the relative ratios between the four frequencies, resulting in a wide variety of stereo changes to the sound. Some of the changes are subtle, others less so. SyncLimiter works well on drums and rhythmic material like choppy comping. You may even like the way that it can muddle up pads, but using it on vocals is probably limited in its appeal. And actually, there are no rules - and any that you are given are probably interesting to try breaking. I'd be very interested to see in what ways this is mis-used! I also apologise here to anyone who is offended by this flagrant exploitation of limiting, and I also have to warn users that there may be clicks present in the output of this effect, despite my best efforts with Max's 'line'. This is a dirty and crude effect - you have been warned! Is a very Low threshold too much? Inspiration - It Is All Around You.